You can find a portable loo hire company in your area by selecting the required county from the drop down box below. You will then be shown a list of portable toilet hire companies in your area. Or click here to make an enquiry to a number of hire companies in one go. 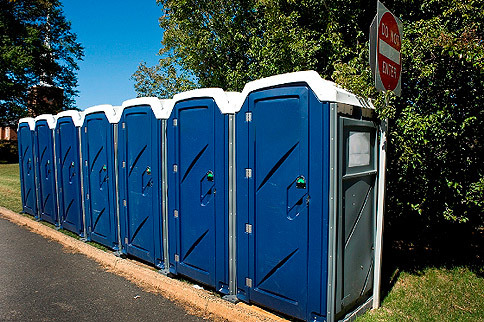 Portable toilets for hire are often thought of in two main situations - construction sites and events. In both cases, the inclusion of toilet facilities of some kind is an essential consideration for the comfort of the attendees and workers. With regards to events, if there will be more than 50 people present, then making sure that there are toilet facilities available for guests is usually considered essential, especially if your venue is not connected to mains drainage. These days, portable toilets come in all shapes and sizes, ranging from a basic sentry box to a unit with vanity basins, gold taps and piped music. Portable toilet facilities can be linked directly to a venue or a marquee by a walkway or you can put them within a marquee of their own, to ensure that your guests don’t have to face the elements. The portable toilets will be delivered, collected and serviced by the provider so you shouldn’t have to lift a finger. The answers to these questions will help the company to advise you on how many toilets are required for the number of guests you have attending, what type of facilities will best suit your event and how often they will need to be emptied and cleaned. Depending on how long you want to hire the toilets for, the hire company should service them on a regular basis. You should check with them how often they will need to do this and what time of day will be most suitable for both the company and yourself. 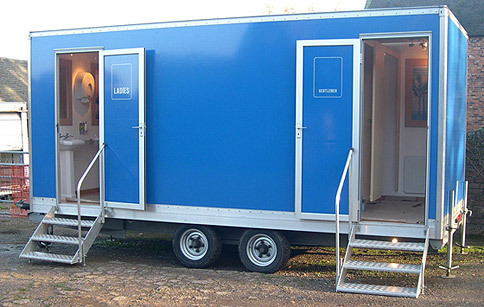 There are a wide range of toilet facilities available for you to hire – from the basic traditional portable unit commonly found on building sites to the more extravagant luxury toilet trailer. The basic portable unit should include a flushing system, toilet paper and hand washing facilities. The more luxurious units can include a range of extra touches. Things like: mirrors, lights, gold taps, hand towels, electric hand dryers, flowers, air fresheners, coat hooks, liquid soap, perfumes and even an attendant! Baby changing facilities, disabled toilets, mobile urinal systems and showers are also available from many hirers. If you are likely to require these for your event then make sure you ask if they are available from the suppliers you contact.